So there I was sitting inside of a giant eight-foot skull pretending to think about bodily remains and Death’s crackly calcified laugh but I was completely distracted by huddles of babbling children running in and out of the thing, this skull with an entrance and an exit. 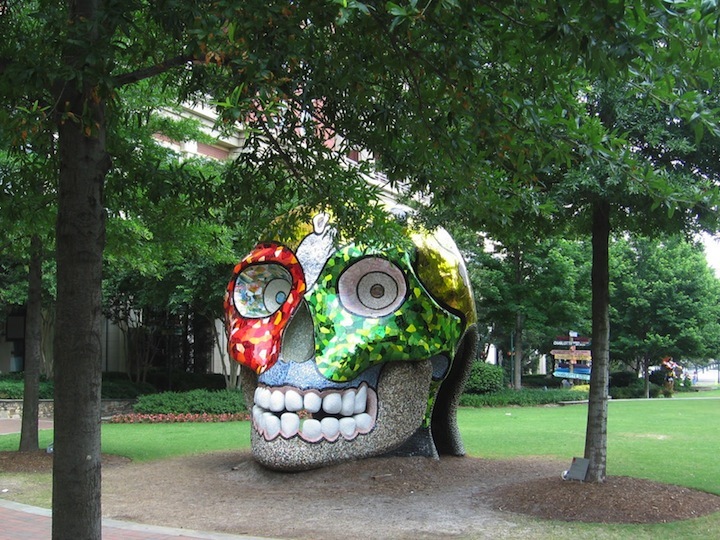 “La Cabeza,” a wild-eyed and multicolored death’s head by the French artist Niki de Saint Phalle, is far removed from the mournful aspect that such a symbol typically represents. Accompanying “La Cabeza” in Garfield Park are Saint Phalle’s trademark goddess figures, the Egyptian deity Horus, totems and a serpent tree as well as the Conservatory’s always-pleasing vegetal spectacle. Although excellently crafted and satisfying in many ways, perhaps Saint Phalle’s sculptures are no rival to the Conservatory’s own collection of succulents, a menagerie of unwavering poise and manageable sublimity. But I digress – Nature’s aesthetics aren’t in the purview of this art writer. For being a skull, “La Cabeza” is curiously teeming with life. The piece is fully interactive. Children are writhing inside of it, poking their heads out from between its opalescent teeth, and feeding on its wonder to fuel their fun. Sure, it’s a flashy piece of mosaic-work with layers of texture, perfect for the sensual adventures that get kids excited about their world, but “La Cabeza” is also a highly charged piece of public performance, complete only when children are present. As a prop for societal taboos, it is perhaps even more pertinent when we notice that it is simultaneously natural and off-putting for child’s play to take place inside of a giant skull. It is possible, however, to look at “La Cabeza” and think nothing of individual demise. As a public artwork, it succeeds on many levels. It’s a meeting ground for strangers, it draws attention to one of the city’s oft forgotten treasures (the Conservatory), it’s monumental, and it incites spontaneous play. Many of Chicago’s other public sculptures (see the broad array of European imports, from the Picasso to Miro, Calder to Chagall to Dubuffet – mostly all from Frenchmen), none succeed as well at being as carefree and proud as Saint Phalle’s “La Cabeza.” Of course, with the addition of the Millennium Park sculpture garden, the public began to receive the new (and confusing) message about communal outdoor art. In “the Bean,” our gaze slides where it otherwise gets cut up on the city’s jagged edges. Yet, “the Bean,” the high-tech water fountain and the explosive band-shell are couched in the same old voice of well-ordered Neo-Classical authority. I’m reminded of a lyric from a dance song where a robot voice sings, “Everybody have some fun;” this always freaked me out a good deal. Some of the palm trees in the Garfield Park Conservatory are the largest of their kind growing in North America. Outside of the glass and steel shell, they would be twice as tall. In Chicago and almost every other Western metropolis, a civic sculpture usually accompanies a fine piece of government-use architecture. It is understood that both the buildings and their attendant sculptures, for all purposes, are perfect forms of social engineering: that to be inspired by beauty will inspire civility. This is best understood when taken to an extremely austere end (Saint Phalle’s polar opposite), namely the Mussolini-era architecture of Italy. In the 1920-40s, fascism expressed itself, and thus expressed its citizens, in the form of spatial control. The emblem and essence of triumphant civic architecture is one of the subjects on hand in Per Kirkeby’s exhibition at the Arts Club. 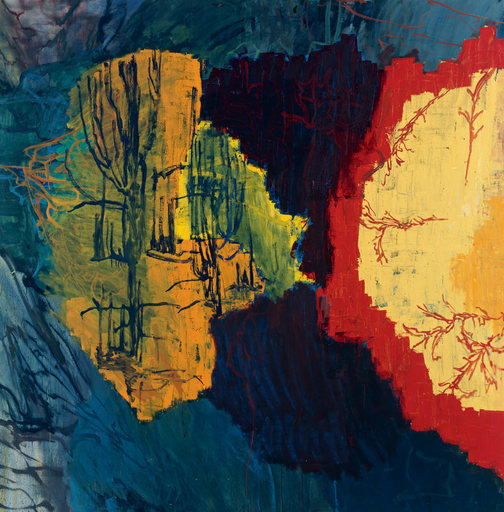 World-renowned for his Brutalist-style public brick sculptures, we get instead a smattering of Kirkeby’s Expressionist-flavored oil paintings and the cast bronze models for his architecture/sculptures. The Danish sculptor keeps a studio in Italy, thus (what I think is) Kirkeby’s strong engagement with ideologically assertive architecture. The small works (all from 1985-1990) are hand-molded from clay into often roughly symmetrical four-part chambers with arches, tunnels and rooms that serve as imagined points of access and control. It is easy enough to project one’s imagination into these forms as if having a physical, spatial experience. Vision becomes compartmentalized and visual movement is restricted, bouncing around in the austere architecture reduced in its severity by the presence of finger-tempered dimples in the cast bronze. On a nearby wall, Kirkeby’s paintings of traditional and triumphal government architecture float in correspondence with abstract structures. Like in a Basquiat painting, the identifiable, even totemic, figures are realized according to an ideal (i.e., an internalized form of self-governance, i.e., the buildings did their job of persuading its user into (in)action) but Kirkeby subtly shifts them into a workspace for their re-education program. There’s visual satisfaction to be had in the state-appointed style because, as Classical forms, their familiarity is their appeal. When not re-working institutional architecture, Kirkeby explores a more personal aspect of the world. His paintings of grottoes and landscapes invite a sense of individual interaction with nature, showing that to be hidden inside the earth is another sort of comfort. As an expression of beauty is the culmination of so much self-discipline, and our shared aesthetic experiences are everywhere ordered to the highest degree, to be happy is to be tamed.